Hsing Wei Machine Industry will introduce its latest innovation and designs at the K2016 plastics and rubber trade fair in Germany on October 19-26. 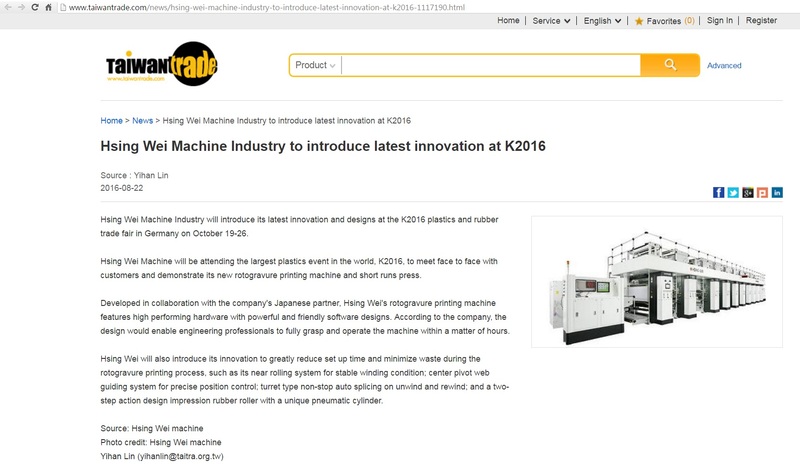 Hsing Wei Machine will be attending the largest plastics event in the world, K2016, to meet face to face with customers and demonstrate its new rotogravure printing machine and short runs press. Developed in collaboration with the company's Japanese partner, Hsing Wei's rotogravure printing machine features high performing hardware with powerful and friendly software designs. According to the company, the design would enable engineering professionals to fully grasp and operate the machine within a matter of hours. Hsing Wei will also introduce its innovation to greatly reduce set up time and minimize waste during the rotogravure printing process, such as its near rolling system for stable winding condition; center pivot web guiding system for precise position control; turret type non-stop auto splicing on unwind and rewind; and a two-step action design impression rubber roller with a unique pneumatic cylinder.